The Bible is packed full of marvelous metaphors. One such metaphor is the story of the tabernacle and temple in the Old Testament. In this story, the Israelites wandered in the wilderness for 40 years after leaving Egypt, taking with them a portable, tented tabernacle. Later, following their conquest of Canaan, they built a permanent temple in Jerusalem. 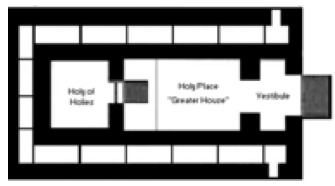 The tabernacle and temple both served as houses of God and both were of similar design, essentially consisting of outer and inner rooms. The outer room, or Holy Place, represented sanctified ground where priests could gather. Beyond it, the inner room, or Holy of Holies, represented the dwelling place of God Himself. 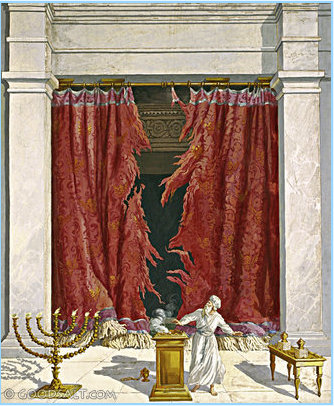 The high priest alone could enter the inner room once a year to perform his duties. A massive veil, or curtain, separated the outer and inner rooms. It was embroidered with cherubim, who protected the holiness of God within. This veil between the outer and inner rooms represented the separation of man and God. In fact, no actual curtain, wall, door, or mist exists between us and Spirit. The veil is a metaphor representing our belief that we are separate from Spirit. It is an illusion we created for various reasons. But even though it is an illusion, it holds our perception of physical reality in place. Most of us still believe the physical “reality” is the only reality that exists, because the veil blocks our view of the spirit realms that lie beyond it. The veil also blocks our memories of previous incarnations. That is why we sometimes call it "the veil of forgetfulness." Because of the veil, we can't remember our past lives after incarnating. We can't remember what life is like for us in between physical incarnations when we dwell in the spirit realms. We can’t remember who or what we really are. We can't remember the real reason we came to the physical world. Since we can't remember these things, we are lost and don't have a map. Some people believe the veil must be preserved. They say that access to Spirit might be dangerous for us, and any bleed-through from “the other side” could expose us to the threat of evil spirits, black magic, and witchcraft. Others claim that the veil keeps duality fixed firmly in place and we need duality for spiritual growth here in the physical world. The separation of physical and spiritual realities is just one example of duality. The veil, they say, keeps us from being distracted by the beauty that lies beyond it and helps us stay focused instead on the work we came to do here in the physical world. The veil’s penetrability varies from person to person and for each of us over time. This is so because each of us has achieved and continues to achieve different levels of spiritual growth. This is why some people have been able to gain greater access to the spirit realms than others. Few of us believe that penetrating the veil is an easy undertaking. But it is possible to do so. Indeed, we can walk in both the physical world and the spirit realms. We can maintain a viable relationship with our guides, friends, and loved ones who dwell in Spirit. We can relate to them just as we do with friends and family here in the physical world. It is not only possible -- it is normal and natural to do so because we ourselves are spiritual beings, even if we are temporarily encased in physical bodies. There are various ways to penetrate the veil. For example, millions of people have had near-death experiences in which they died temporarily but were revived and returned to tell us about their experiences. But we do not have to die physically to make contact with “the other side.” There are other less drastic means such as out-of-body experiences, meditation, visualization, hypnosis, mediumship or channeling, after-death communications with loved ones, and automatic writing. Many people are surprised to learn that we leave our physical bodies every night and travel beyond the veil to the spirit realms when we are dreaming. The veil seems to have become thinner now, and gaining access to “the other side” seems to be easier than before. I believe this is a result of our accelerated spiritual growth in recent years -- along with our desire to create a closer relationship with Spirit and our faithful adherence to spiritual practices such as meditation. As the veil has thinned, our feeling of separation from Spirit has diminished. Meanwhile, our ability to see beyond the veil and even travel beyond it has grown. 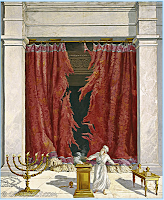 Do you remember the New Testament story in which the temple veil was rent, or torn from top to bottom, in that moment when Jesus died on the cross? This story symbolizes an end to our belief in separation from Spirit. We can now enter into the presence of God. We are now free to enter the heavenly realms, if we so choose. We can remember our past lives and the lessons we learned during our past lives. We can then apply these lessons to improve our current life. We can re-discover the lessons we pre-planned for our current life while still in Spirit before incarnating this time. For example, I have learned why I came to live in Panama in this lifetime, thanks to a friend who channels ascended masters. Our experiences in this lifetime begin to make more sense when we are able to penetrate the veil. We can contact loved ones who have already transitioned back to “the other side.” We find we are not really separated from them after all. They are happy. Our grieving can end. During meditation, I have often journeyed beyond the veil and encountered my father who transitioned back to the spirit realms in the year 2000. We can meet our spirit guides to receive their advice and encouragement. I often spend time conversing with my primary spirit guide "Max" in a garden of resplendent beauty, where I go during meditation. We can learn there is no real reason to fear anything here in the physical world, including misfortune, accidents, illness, or even death of our physical bodies. We ourselves create every experience we have here in the physical world. Our physical bodies turn out to be illusions we created for the duration of our stay here. We can re-discover that life on “the other side” is just as real, if not more real, than life here in the physical world. And it is vastly more beautiful. We can discover that we are, in fact, spiritual beings and that our real home lies in the spirit realms. We come repeatedly to the physical world for brief lifetimes that amount to little more than a flash in the pan. We can achieve enlightenment by discovering the truth that lies beyond the veil. Once we achieve enlightenment, we may no longer need to reincarnate again and again into this “vale of tears” -- this physical world with its pain and sorrows. We can finally know for certain that this physical world is an illusion, just as the veil itself is an illusion, because we are not, and never have been, genuinely separated from Spirit. The veil is lifting because we no longer need it. Our belief in separation from Spirit is ending. The physical world and spirit realms are once again merging. We may no longer need to maintain the illusion of a physical world. I am brand new here.This is the first discussion I have read, aside of the initial answer to my initial question which brought me here, via an internet search result, in the first place. I have to say thus far your words and explanations have made the most sense to me of any I have ever found and I feel some sort of connection here....like Ive found something that I was meant to find. I know that sounds strange and perhaps I am explaining it wrong. I just feel you have loads of wisdom to share and that you can help me with numerous issues I have struggled with for some time now. I am so happy to have found this website, and you. Thank you so much for creating this website and sharing your thoughts and knowledge. I have in recent becoming more aware,maybe due to more asking? I remember something of 7 veils,could you elaborate? I am getting better at speaking to my guides,which I have 3. Christianity doesn't have any connection with New Age belief system. I was told that I have a Veil on me. What does that mean? I to have been told several times by strangers in different states, that I have a veil on me. What does that mean? also i see things in dreams, that happen to me in another life and it scares me. Do you still reply to comments on this, Roy? Something as sacred as what lies beyond the shadow, should not be tampered with. Humanity is so distracted by spiritual elevation, they forget the wisdom and sacrifice necessary to achieve it. Don't consume you're life with petty attempts towards immortality. Life is but a blink of an eye. Always within reason and doubt. The veil is there for a reason, mankind is not ready to go beyond what they know as Truth, because most use their minds rather than their Hearts. The temptation to be known and succeed are greater on this plain of existence than any other level of awareness and spirituality, because is the basic level, the bottom rung of the ladder, where temptation is thrown at you from all directions, where you have to earn a living in order to survive according to what we are taught by society/culture, where diverse beliefs and religions exist, where mankind believe they are superior to each other or try to be, where we fight among ourselves for assets rather than to protect, dont let anyone tell you that they know more than you, you are your own person, spirit, you are your own teacher and student, no one know more than you do. Anonymous, you can always tell if someone is truly spiritually aware and they care, question them, test them, push them and they will answer within days, they would never dream of leaving you alone. Good work Roy, you are spot on! Each of us DOES plan out our lives, this is why every time you come up against a challenge in life, and you don't know how you will make it, somehow you always do. Because YOU planned it! Yes, reincarnation is true, so it is not life after death, rather, life after life. Indeed all those who have died a physical death are just fine in the spiritual realm just as Roy states. Personally, I am kind of blown away because this Roy man, well he is further ahead that almost every other person living on this planet. I am very happy to know a kindred soul of spiritual consciousness is here and working to share in this grand unveiling. For years, I sat in meditation, waiting for my spirit guides to contact me, but they never showed up. Then I discovered a technique called creative visualization, and the first time I used this technique, I met my primary spirit guide. In other words, instead of waiting for my spirit guides to come to me, I went to them, and it worked immediately. 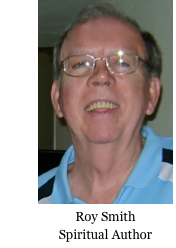 You can read more about how this worked for me in various Spirit Quest blog posts including this one: "How to Establish a Working Relationship with Your Spirit Guide" by clicking on this link: http://www.spirit-quest.net/2013/11/how-to-establish-working-relationship.html. Hi Roy. Recently I did a healing on a father who had lost his son through suicide. I saw a veil between him and where his son was. Does it mean his son is in transition of this world and spirit? I would like to know how to correctly see beyond the veil I am.drawn to medium ship. Can u help me? As a point of interest the Jewish Temple in Jerusalem has a layout which symbolised the body of Jacob as he lay in vision. He body is represented by the "holy place" and was called "earth". His head is represented by the "most holy place" and was called "heaven". The steps between the two "holy places" represented where the angels "descended and ascended". The huge veil which hung between the two "holy places", with its beautiful artwork of angels, represented the separation betweeen "earth" and "heaven". That vail was torn from top to bottom at the death of Christ. The Temple itself was destroyed approx 40 years later. Speaks volumes to me that the divide between heaven and earth is not to be seen by man as real but its pure perception. I use to "see or feel things" but suppressed them because I was made to feel like if it isn't tangible then it isn't real or I was just dreaming. I was told recently that i need to get back into exploring my spiritual side and step behind the veil. Shed some light as to what this means. This is great information. When I am explaining to someone that it's like peering through a dark sheer curtain or a really dirty window before it seems to open up and suddenly you are in two places at one time and very conscious of both. For me it it was a most enlightening experience. Thank you for your information.